1.1. AA Safaris And Tours provides safaris services which include transportation, accommodation bookings, restaurant meals, excursions and other services in cooperation with independent suppliers. 1.2 All information provided in the client tour programs is given to the best Knowledge of AA Safaris and Tours ltd basing on the latest information available. AA Safaris and Tours ltd cannot be liable for modified information from third parties, nor for any obvious typing errors. 1.3. Before booking a safari, the client must inform AA Safaris and Tours ltd of any preferences and special requests of the participants; these can include. Medical needs, diet, requirements relating to disabilities and any other requirements. 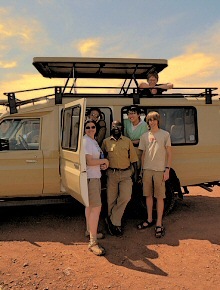 AA Safaris and Tours ltd will try to meet the requirement if these are possible. 1.4 All our Uganda and Rwanda safari packages are subject to availability and not guaranteed until confirmed. A number of lodges and hotels used by AA Safaris and Tours Ltd have limited capacity and therefore it is crucial to make reservations well in advance of your planned trip. 1.5. To reserve flights and gorilla permits we need your full names as they appear in passport, your nationality and passport number. 1.6. In cases that you may wish to amend your reservation, AA Safaris and Tours ltd will make the preferred modifications where applicable and possible and we will confirm accordingly. AA Safaris and Tours ltd reserves the right to charge an amendment fee relative to the actual costs, which will be added to the total invoice. 1.7 AA Safaris and Tours ltd reserves the right to change and re-adjust the tour schedule, transportation, accommodation and services indicated in the itinerary in the event of unforeseen circumstances before arrival. Any changes to the itinerary will be communicated to the client as soon as possible. 2.1. Our prices are quoted to include; ground transportation, English speaking driver/Guide, overnight stay at hotels, tents, lodges as specified, all meals as indicated on the itinerary, Entry Permits where applicable, park entrances, sightseeing as stated in the program , bottled mineral water and airport transfers where applicable. 2.2 Expenses that are not covered: drinks, visa fees, airfares both International and domestic, travel Insurance, tips and gratuities for Guides and accommodation staff, Laundry, and any other items of personal nature. 2.3 Our prices on the website or quoted to our clients are subject to change without notice and are not guaranteed until confirmed in writing. 2.4 AA Safaris and Tours ltd reserves the right to adjust prices at any time should there be any fluctuation in the exchange rate or increase in the cost of any element of the tour. The company will however make every effort to minimize any increases. 3.1 Our safaris are organized in such a way that animals are visited or seen from their natural habitats. We therefore cannot guarantee wildlife or game viewing. You must take caution when viewing the animals and carefully follow the instructions given by either the tour guide or wildlife rangers. Gorilla Permits and Chimpanzee permits guarantee that clients will be able to track primates but it does not guarantee that you will see them. 3.2. Our accommodation is based on a twin or double bedded room, tent or banda, with private bathroom where possible. Single rooms may be available with the payment of a supplement fee but availability cannot always be guaranteed. 3.3. AA Safaris and Tours ltd reserves the right to substitute equivalent or superior hotels. If a hotel of equivalent standard is not available AA Safaris and Tours ltd may substitute the next best quality hotel or suggest superior standard accommodation (extra charges may apply in the later case). 3.4. The mode of transport to be used will depend on the number of clients and the route taken, based on the specifications of the chosen itinerary. Every effort is made to ensure that vehicles are provided in a roadworthy condition but no liability can be accepted for a puncture, breakdown, damage, or any delay as a result of the poor road conditions. 3.6 Experienced English speaking driver/guides are a key part of your tour. They are the only person(s) allowed to drive AA Safaris and Tours ltd vehicles’. The driver’s decision on all matters, such as the route taken, is final. 3.7 AA Safaris and Tours ltd reserves the right to alter any route or arrangement, to cancel the operation of any scheduled tour or vary the safari services in any way in the event of unforeseen circumstances, such as road closures, bad weather, problems with national parks or hotels and security considerations. In such cases, alternative arrangements will be made as circumstances permit. 3.8 AA Safaris and Tours Ltd reserves the right to employ subcontractors to carry out all or part of the services agreed to be supplied. 3.9. AA Safaris and Tours Ltd reserves the right to stop any person from participating or continuing any tour if, in AA Safaris and Tours’ opinion or in the opinion of any person in authority, the person concerned behaves in a way that may cause or is likely to cause danger, hazard or inconvenience to third parties, or damage to property or to environments and ecosystems. In this case No refunds will be made and AA Safaris and Tours ltd will not be responsible for expenses that will be incurred as a result of Termination. 4.1. All tours will be booked and confirmed only upon receipt of a 30% deposit of the basic program rate. For gorilla , chimpanzee and other permits that require pre-booking, a full advance payment of the permit fee is required in order to make the reservation. 4.2. The balance of the Fees will then be due not later than 50 days prior to the safari, unless agreed otherwise. 4.3. All bookings that are confirmed within 50 days before arrival must be paid in full at the time of confirmation. 4.4. If payment is not received in accordance with the above, AA safaris and Tours ltd reserves the right to cancel the booking. 4.5. Payment can be made by; Telegraphic Bank Transfer, Credit and Debit card (Maestros , Master Card, American Express and Visa – Subject to a 7% Service Charge), and lastly by Cash at our Offices. We regret to inform you that travelers Cheques are no longer acceptable. 4.6 All costs of telegraphic transfers shall be fully cater for by the client. The same applies to the 7% service charge on credit and debit cards. 5.1 All Safari cancellation requests must be made in writing and shall be effective on the date of actual receipt by AA Safaris and Tours ltd.
AA Safaris and Tours ltd reserves the right to deduct all expenses incurred in forwarding the money back to you. 5.3 Gorilla permits, chimpanzee Permits fees are non refundable whereas tickets are refundable basing on the policy of the airline company. 5.4. AA Safaris and Tours ltd, will not make any refunds for any unused services, late arrival or no-show of any of the members of the tour. 6.1 As AA Safaris and Tours ltd we will try to ensure that the company exceeds the expectations in every area of the safari arrangements. However, suggestions are very much appreciated in order to keep improving the quality of the service. 6.2 All complaints must be reported immediately to the AA Safaris and Tours representative and to the supplier of the service in question, who will do their best to resolve the matter. If the problem is not solved to the client’s satisfaction, the complaint should be reported in writing and not later than 30 days after completion of the tour. 6.3 Liability for any complaints not notified in accordance with the above described procedure shall not be accepted. 7.1 AA Safaris And Tours ltd will work hard to make sure that all arrangements and services offered as part of the safari are carried out as specified in the most efficient way possible. However, the company does not have direct control of the provision of services by suppliers and, whilst every supplier is chosen with the utmost care, AA safaris and Tours will not accept liabilities for errors or omissions of such suppliers. 7.2 AA Safaris and Tours ltd shall not be liable for any loss, damage or injury of any nature whatsoever whether to person or property. 7.3 Whilst every care is taken, AA Safaris and Tours ltd cannot be held responsible for the direct or indirect costs of loss or damage to baggage or personal possessions. 7.4 AA Safaris and Tours ltd cannot accept liability or pay compensation for unforeseen circumstances beyond the control of the company or its staff. These include; flight delays/cancellations or force majeure such as war or threat of war, riots, civil disturbances, terrorist acts, border closure, acts of government or other authorities, strikes, thefts, epidemics, road closures, industrial disputes, natural or nuclear disaster, extreme weather conditions, fire, technical and/or mechanical problems to transport and all similar events beyond the company’s control. 7.8 The respective laws of the country govern AA Safaris and Tours Ltd’s liability to passengers carried in its own vehicles. All claims are subject to the jurisdiction of the courts of the country in which the cause of action arises.